High quality Portfolio with rigid, durable cover and 10 integrated 4-pocket pages for all standard and Japanese sized gaming cards. Holds 80 cards in sleeves Great space for traveling and to have a wide selection of cards at tournaments. Made of extra clear and archival safe polypropylene. Free of PVC and acidic materials. Keeps your card collection safe and prevents your cards from getting bent during transport. 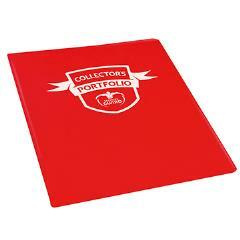 Makes your portfolio and the integrated pages very durable and highly reliable for safe transport and storage.